There are many famous directors in the world and most of them have made a name for themselves for either creating action-packed films (Michael Bay), dark and quirky films (Tim Burton), or plot-twist heavy thriller films (M. Night Shyamalan). But there is more to M. Night Shyamalan than his crazy plot twists. He actually once wrote a children’s film! 1. Sixth Sense was inspired by an episode of Are You Afraid of the Dark?. According to M. Night, the film is based on the episode “The Tale of the Dream Girl”, where the premise was: the lead characters are being ignored by the friends/family and don’t understand that they are dead until the end of the episode. 2. M. Night does not like to use CGI. So the crop circles in Signs were real. Well, real in the sense that they were made for the film. As far as we all know, M. Night has not had contact with aliens leaving crop circles. 3. M. Night Shyamalan wrote Stuart Little. Yep. This film about a mouse that is adopted by a human family and plays soccer was co-written by M. Night Shyamalan. He did not, however, write Stuart Little 2. 4. The entire plot of Lady in the Water is based on a bedtime story M. Night Shyamalan wrote for his children. 5. 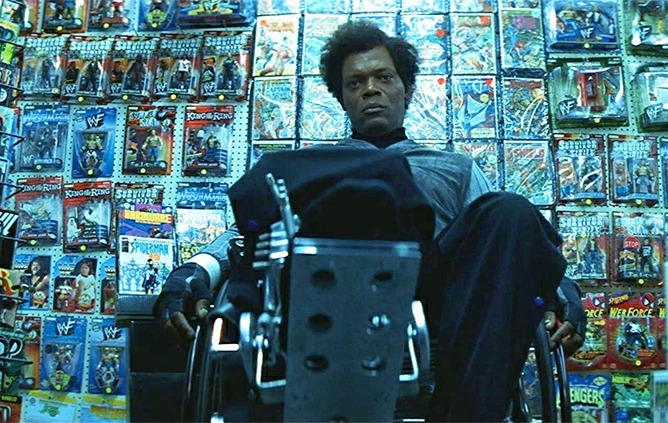 M. Night wrote the screenplay for Unbreakable with Bruce Willis and Samuel L. Jackson in mind. He always anticipated the two actors agreeing to do the film. This was also their fourth film together, after Loaded Weapon 1 (1993), Pulp Fiction (1994), and Die Hard: With a Vengeance (1995). 6. The Happening is the only movie of his in which M. Night does not physically appear. He’s the voice of Joey, who calls out to Alma a few times in the film. 7. All of his films are set in, or very close to, Philadelphia. The Village, which takes place in the woods and the town folk believe to be somewhere entirely else, takes place in Philadelphia. As proven by the security guard at the end of the film reading The Philadelphia Inquirer. The Last Airbender does not take place in Philadelphia (or “this” world), but some principle shots for the film were done there. 8. After Earth was the first film in over 20 years where M. Night accepted to direct a film that someone else wrote the screenplay for. Will Smith personally asked him to direct the film, after wanting to work with the director for years. The film was poorly received critically and in the box office. We assume that he’s learned his lesson since then. 9. M. Night has habit of including car accidents in his films. For example, in Sixth Sense Cole tells his mother about his powers while they’re stuck in traffic because of a car accident. In Signs, Graham’s wife is killed in a car accident, which coincidentally enough, M. Night was the driver at fault in that accident. 10. He put the entire cast of The Village through a 19th century “boot camp”. This was done in order to prepare for the time period they were meant to portray and to give them a good feel for it. 11. He was approached to direct films in the Harry Potter series, three separate times. He was offered to direct the first film in the franchise, on the recommendation of his friend Steven Speilberg, but he turned it down due to commitments for Unbreakable. After the massive success of Signs, he was again approached to direct, for Harry Potter and the Prisoner of Azkaban and then later for Harry Potter and the Goblet of Fire, but he turned both films down to work on The Village and then his since-dismissed adaptation of Life of Pi. 12. He was approached to write and direct for the remake of Batman and the original Spider-Man films. He was offered the chance to write and direct new versions of both Spider-Man (circa 2000) and Batman (circa 2002), but having already directed a superhero project, Unbreakable, he turned them down. 13. He was also approached to direct The Chronicles of Narnia: The Lion, The Witch, and The Wardrobe. Could you imagine the plot-twist he’d have with Aslan in mind? We can only guess. Which fact is the most surprising to you? Share your thoughts in the comment section below!